In my case we were looking for a dog trainer who could help us out to solve some of Pippa’s behaviour issue. Pippa is our adopted female mongrel (Beagle x Ibizan Hound mix). There was some specific kind of dog that made her jump in an aggressive way, plus we also wanted to work some fears that she used to have on the street. We met with some dog trainers who, without even seeing Pippa, were talking to us about the punishment pinch collar. 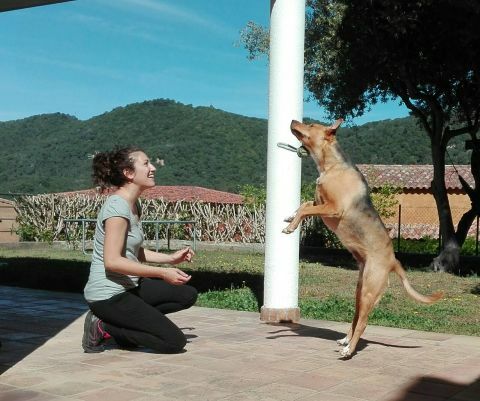 So, I started to look for information and get into the dog training world, knowing its different branches and methodologies, and I decided to start my own training as a trainer with experts and schools whose methods were based on respecting the dog. I did not know when I started my training that I would love this world so much. I got to know what is behind those hair balls: how they think, how they react, how they communicate, what emotions they feel, …and how all that can affect our way of interacting with them. I discovered that the behaviours and/or emotional problems could be worked, and that it could happen with all respect towards the dog. Other invasive methods that we all have seen on TV were way behind. All this trapped me (in a good way): the dogs, the science behind their behaviour and to be able to teach ways to solve behaviour issues and/or negative emotions in a respectful and positive way. With that seed planted in my brain I have been learning and making my training, my knowledge and my experience bigger. I consider the continuous training a key to succeed in our relationship with our dogs. Every day new tools, new procedures and new data about how dogs learn and behave are discovered. Why shouldn’t we use all that new information to optimize the training? Why shouldn’t we use it in order to optimize the life together for people and dogs? When I decided to get interested in dogs in a professional way, some years ago, I had two main questions: am I the best life partner for Rock, my dog?, and is Rock a happy dog with me? With these questions I started to get into the huge world of dog training and education. Along the way, I have discovered dogs are extraordinary creatures. They are curious animals by nature, sensitive to emotions, with a cognitive side potentially infinite, with an enormous environment adaptation capacity and an incredible communicative language, full of signs that let them sustain solid conversations with their species partners, as well as with others, such as, for example, with us humans. All this information led me to think about the dog education from a holistic point of view, that is, global. In my opinion, educating a dog is not only about “teaching” him to sit, lay down or walk on our side (I write “teaching” because all these are behaviours that the dog already knows how to do by himself. We only set a name for them). Dog education is about bringing on a nice environment for the dog, where he can develop his complete potential on our side. Everything grounded in the creation of a stable and healthy bond between the dog and his guide that lets the first one to get all his natural tools for problem solving, and the second one a training on how to join his dog on this individual and collective maturation process. 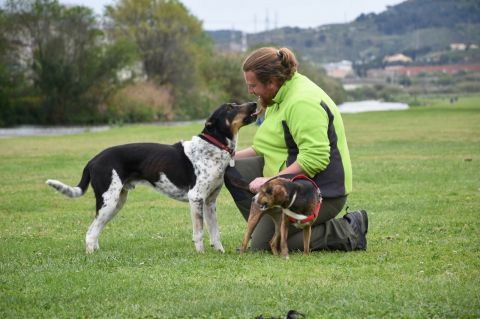 In summary, a nice education, with no punitive or coercive methods, is the right way to make our dogs enjoy a full life and to be able to participate in this full life, by collaborating with our life partners. I graduated in Art History, but when searching for a job I understood I should follow my deep passion for dogs. At the beginning, it was just plain love, with no specific knowledge. After that, once I started studying how do they learn, how do they interact between them and with people, a new world was opened for me. And itis one full of stimuli and that always enriches my life. I have had the chance to study different ways to train with dogs. I have met dog training based in domi-nance with aversive methods, and I have learnt itis much better working with them in a positive way, rein-forcing the behaviours that we like, so they repeat them. That is much better than punishing the ones wedo not like. I started working with dogs in movies in Rome. There I learnt techniques to achieve different skills. Then I decided to extend my training with dog-assisted therapy and in the world of the assistance dogs. Before knowing this part of the canine world, I had never thought that the same dog who we see as a couch potato could offer help to people with physical or psychological disabilities. This field got into my heart, so I always kept studying about training with assistance dogs, besides basic obedience and behaviour modifica-tion. Something itis always inmy mind and itis that you never stop learning from dogs. There is always some-thing new to think about to establish a confident relationship with them. 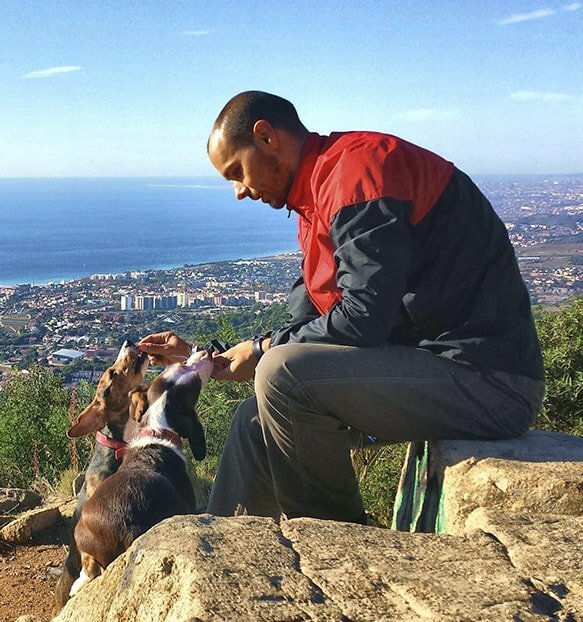 My goal with the families with dogs isto help them as much as possible to get the tools (not only material tools and not only based on obedience commands) to understand their dogs. I work on this so they learn how does learning and emotions work in their dogs, soan effective communication is built between them, always with love and respect. When that happens, dog trainer and dog guide (his/her human) get extreme satisfaction, since the change can be seen in the dog’s eyes… their looks get transformed, and they seem to say: At last we understand each other!. This is, for me, a great job.